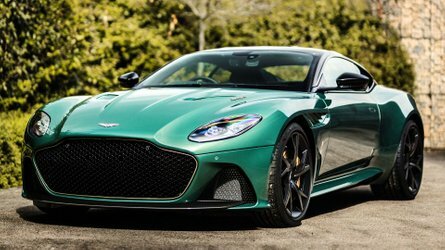 The supercharged V8 engine makes 758 horsepower. The Hennessey VelociRaptor nameplate isn’t new. The Texan tuner has used it for the last several years to denote modified Ford Raptor pickup trucks. The latest creation – the VelociRaptor V8 – doesn’t hide the most significant upgrade. You see, when Ford introduced the new Raptor for the 2017 model year, it did so with a twin-turbocharged EcoBoost V6 engine making 450 horsepower. 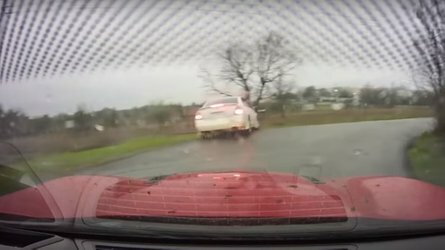 While that was more power than the 6.2-liter V8 produced in the previous-generation Raptor, Hennessey found a niche of Raptor fans who needed nothing less than a honking V8 under the hood. The Hennessey VelociRaptor V8 takes the EcoBoost V6 out and replaces it with a supercharged 5.0-liter V8. 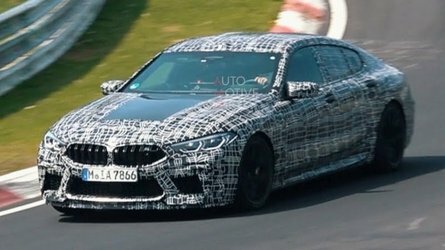 Nothing about the engine is typical, with the aftermarket tuner adding a 2.9-liter supercharger system to the engine, which produces seven psi of boost pressure. The engine makes 758 horsepower at the crank with 570 hp hitting the pavement. This allows the larger pickup truck to hit 60 miles per hour from a standstill in a staggering 4.1 seconds. That’s Mustang GT performance territory. It completes the quarter-mile race in 12.2 seconds at 115 mph. The truck gets a host of upgrades other than the new engine. Hennessey adds VelociRaptor front and rear bumpers, LED front lights, a Stage 2 off-road suspension with a six-inch lift, Hennessey 20-inch wheels, 37-inch BF Goodrich KM03 off-road tires, Hennessey and VelociRaptor V8 exterior badges, Hennessey embroidered headrests, and serial numbered plaques in the interior and engine bay. The Hennessey VelociRaptor V8 starts at $ 147,950, which, thankfully, includes the price of a 2019 Raptor. Hennessey is limited producing to just 100 units. The VelociRaptor V8 comes with a three-year/36,000-mile warranty that covers the Ford truck and conversion. The HennesseyVelociRaptor V8 made its debut at the 2018 SEMA Show. Sealy, Texas (October 29, 2018) — When the Ford Raptor returned to the market in 2017 you could only buy it with the 450 hp twin turbo V6 EcoBoost engine. While no one complained about a 450 hp Raptor, many previous owners did complain about there not being a V8 option. The team from Hennessey Performance (HPE) has been hearing their cries ever since and have answered them. Introducing the 2019 Hennessey VelociRaptor V8. 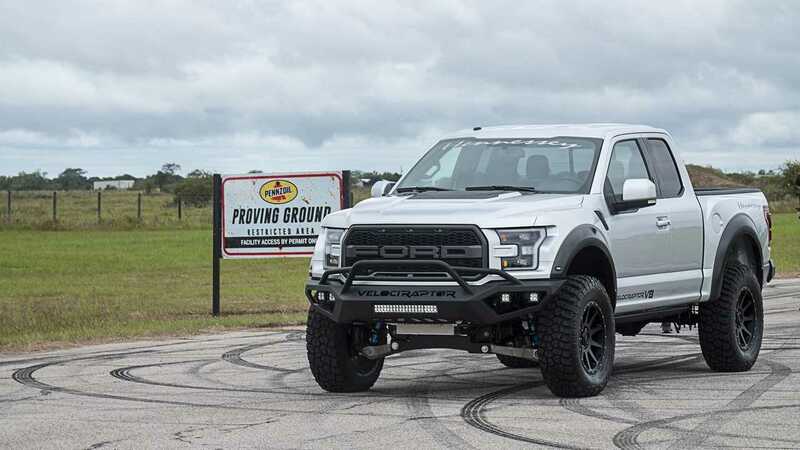 As the name implies, the team from HPE has taken a brand new 2019 Ford Raptor, removed the EcoBoost V6 and swapped it with a specially built Ford 5.0L V8 engine that is supercharged by Hennessey to the tune of 758 hp! The VelociRaptor V8 conversion is comprised of an extensive series of modifications and includes a new 5.0L V8 Ford engine, Ford 10-speed automatic transmission, Ford wiring harnesses, ECU’s and other parts that complete the engine swap. Once the V8 is installed, the Hennessey team cranks up the power to the tune of 758 hp via their 2.9L supercharger system, which produces seven psi of boost pressure. Hennessey’s V8-powered Raptor runs from 0-60 mph in a staggering 4.1 seconds. The Hennessey VelociRaptor V8 conversion also includes: VelociRaptor bumpers front & rear, LED front lights, Stage 2 off-road suspension with a six-inch lift, Hennessey 20-inch alloy wheels, 37-inch BF Goodrich KM03 off-road tires, Hennessey & VelociRaptor V8 exterior badges, and Hennessey embroidered headrests, serial numbered plaques in the interior and engine bay. The price for the 2019 Hennessey VelociRaptor V8 is 147,950, which includes a new 2019 Ford Raptor F-150 truck. 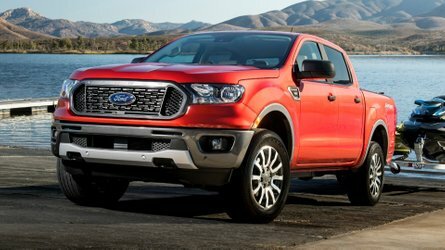 Production is limited to just 100 units for the 2019 model year and each vehicle comes with a 3 year / 36,000 mile warranty that covers the base Ford truck as well as the complete VelociRaptor V8 conversion. The Hennessey VelociRaptor V8 is available directly from Hennessey or from select Authorized Hennessey Performance Ford dealers. For more information, contact Hennessey Performance Engineering at 979.885.1300 or email at sales@hennesseyperformance.com.